Andrew took the buggy (my motorized wheelbarrow)﻿ up through a few trails in the neighbourhood last week. He promptly became stuck in an area that use to be an old woods road. When I went up to help him to get out we found that the old road is now impassible (especially this spring with all the rain). It was located near a natural bog that we went to every fall to find a few cups of cranberries. It seemed the bog was expanding and claiming new territory. The cranberry vines were everywhere (we found some great cranberries there last year), and just finishing blooming. It should be a good crop this year. The Bog laurel (Kalmia) was also in bloom as well as cinnamon fern. Among all this was a pink plant I had never seen before. Upon closer inspection, I realized it was an orchid. I had never seen them in that area before but we may not have been in the area at the right time of year. After getting my sneakers soaked and Andrew out of the mud (not much damage, to the bog, I mean), we went home and got our boots and camera. After taking some pictures of the orchid (2 in fact) we came home and I did some research (love the Internet). Grass Pink is actually quite common in Nova Scotia. It is usually found in lightly shaded sphagnum moss bogs and swampy areas. In this case it was more of an open bog. They get their name for a long, grass-like leaf that comes up from the base. The flowers are on a single stem with 2 or more magenta to pink blooms present. 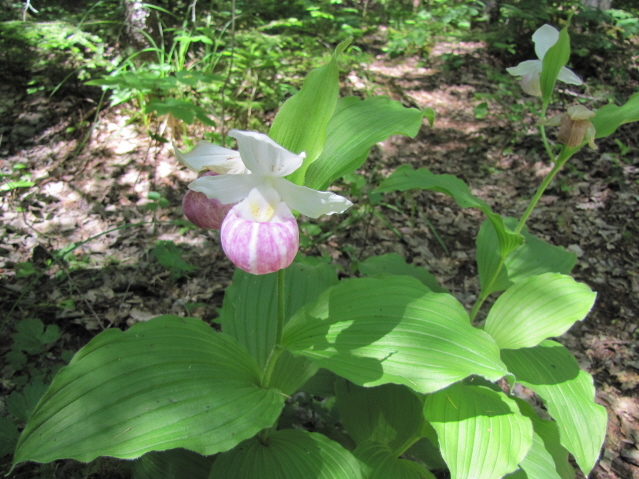 The Showy Ladyslipper grows in a boggy, sweet (limestone) soil.﻿ Cryripedium acaule (Pink Ladyslipper) is more common in slightly drier soils under Oaks or Pines (more acidic soils). Both are difficult to propagate as the require a microbial association with the soil. 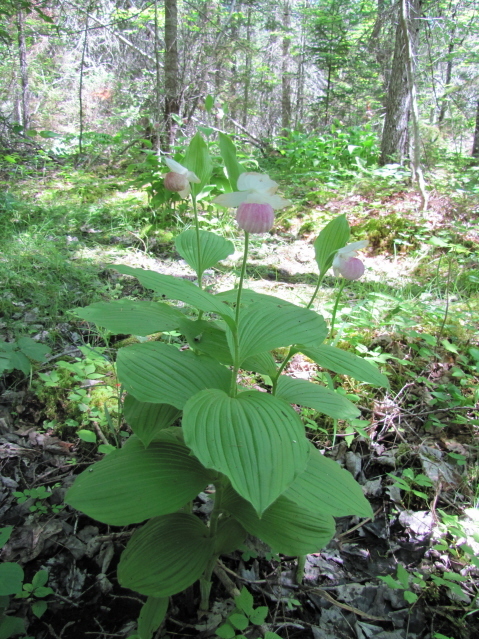 Crypripedium pubescens (Yellow Ladyslipper) is also a native that likes moist soil even boggy areas and is not as fussy in requiring sweet or sour soil. This one is more adaptable to garden soils. It is the only one that I sell and I acquire it from a reputable dealer. There are other sellers of orchids out there but you should do your research before purchasing. 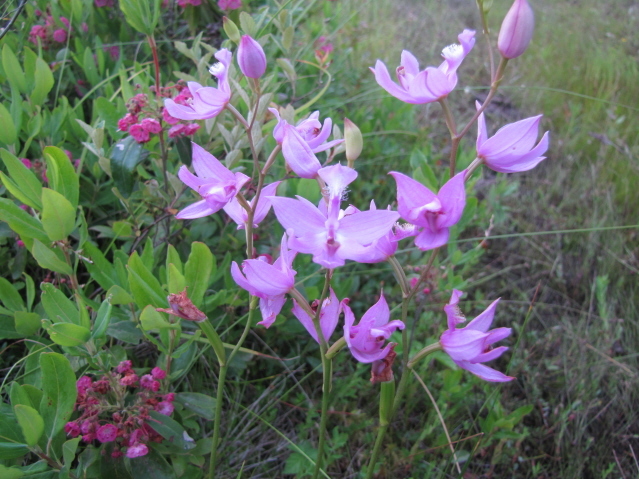 Getting back to the Grass Pink Orchids I found, this one was also present only in a few numbers. It did not strike me as a Grass Pink but I could be wrong. This is where I bow to an expert in the field. Anyone recognise this one?? There are more orchids out there, and they are sparking my interest. It is just fabulous when you find something you haven't seen before. Nice! 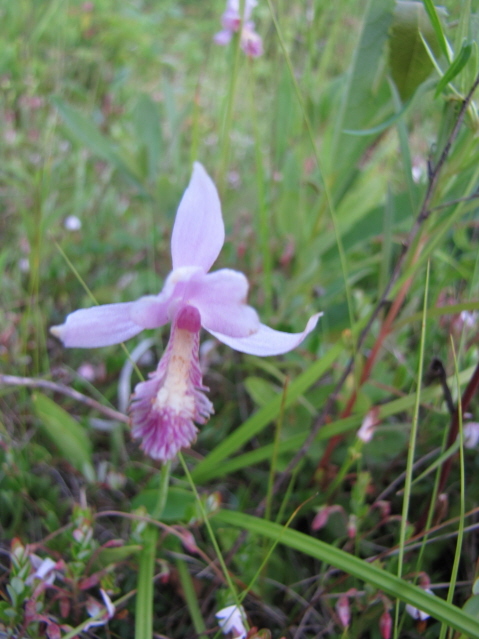 That is Arethusa bulbosa, a common bog orchid in NS. 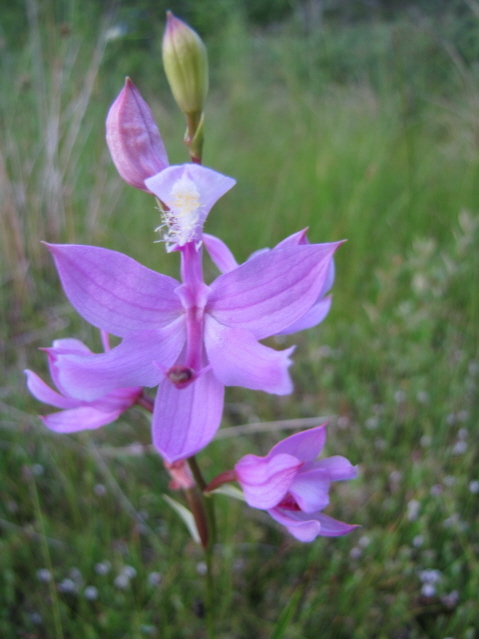 They range from almost white to a deep pink, and can be quite numerous in some bogs.